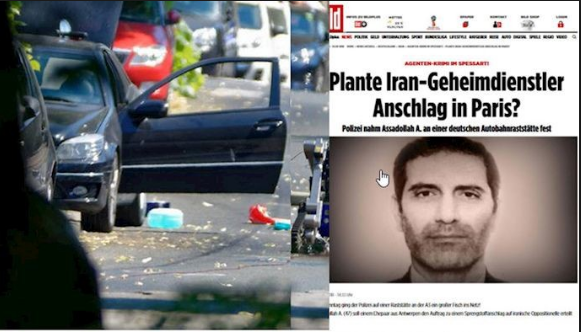 European security officials have intercepted communications that suggest Asadollah Asadi an Iranian official under diplomatic cover was not only involved in a plot last year to bomb the rally outside Paris but coordinated efforts with colleagues back in Iran. The question is that who was chatting with Asadollah Asadi in Iran? Asadollah Asadi who is currently in detention in Belgium. has handed powerful plastic explosives to a Belgian-Iranian couple provided them with 500 grams of TATP explosives. the target was the annual meeting of the Paris-based Opposition National Council of Resistance of Iran (NCRI), Addressed by A wide range of elected representatives, officials, politicians, human rights activists, dignitaries, lawmakers and political figures from all over the world, Among them were former New York City mayor and Trump lawyer Rudolph Giuliani and former House Speaker Newt Gingrich. A car bomb exploded outside the Argentine AMINA building on 18 July 1994. The seven-story building collapsed and 85 people were killed. In 2006, the late Alberto Nisman an Argentine lawyer who worked as a federal prosecutor, and chief investigator of the 1994 car bombing in Buenos Aires, formally charged Iranian officials with directing the 1994 Amia attack. Mr. Nisman was found dead in his apartment on 18 January 2015 with a bullet wound to the head and a pistol lying by his side. According to the investigations by Prosecutor Nisman, the plan to blow up the Jewish center in Buenos Aires was discussed in a meeting of Iranian regime’s Supreme National Security Council on 14 August 1993 by Khamenei (the current supreme leader), Hashemi Rafsanjani (then President), Ali Akbar Velayati (then Foreign Minister), and Ali Fallahian (Minister of Intelligence). Once the decision for the bombing was finalized, Khamenei tasked the intelligence ministry and the revolutionary guards’ Qods Force (IRGC-QF) to carry out the bombing. At that time, Ahmad Vahidi was the Commander of the Qods Force and Mohsen Rezaee was the Commander of IRGC. To end this, in circumstances that protests across Iran and MEK's resistance units activities against the Icon of the regime is escalating in different cities, and the international campaign such as Warsaw summit and international isolation of the regime throughout the globe are placing further pressure on Tehran’s mullahs, it remains necessary to expel all terrorists who carry out the regime’s agenda under diplomatic cover. Iran's policies of terrorism and political assassinations require combined action from the United States and the European Union.